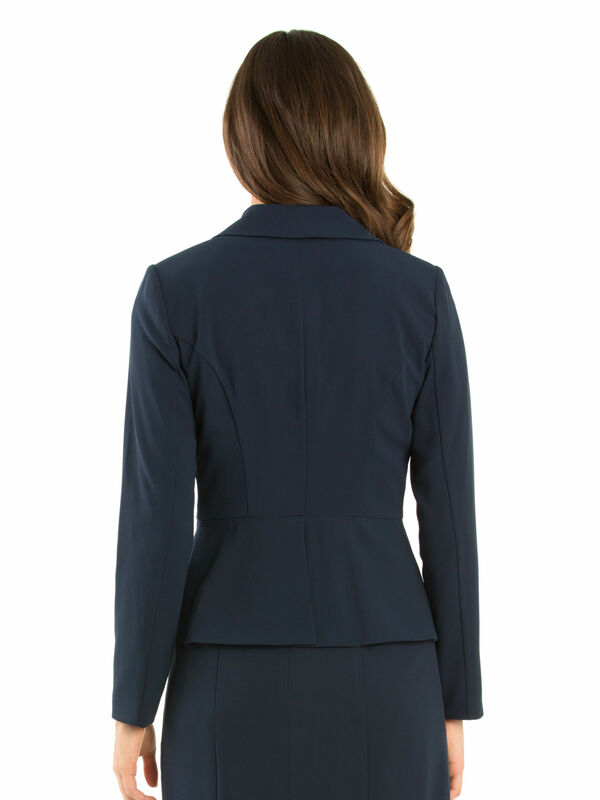 Aries Jacket https://www.review-australia.com/au/aries-jacket-navy/RE18JK009.RENVY001.html Take a more relaxed approach to 9-5 dressing with the newest piece of the suiting range, the Aries Jacket in Navy. In a work appropriate heavy crepe fabrication, this waterfall blazer has a beautiful open drape. For a power suit look with all the power but more femininity, pair with the coordinating Aries Skirt. Take this blazer to the weekend by styling with a pretty blouse, jeans and boots. Worn with Polly Skirt, Ashlyn Knit Top and Brenda Heels. Model wears a size 8 and is 177cm tall with a 63cm waist. Take a more relaxed approach to 9-5 dressing with the newest piece of the suiting range, the Aries Jacket in Navy. 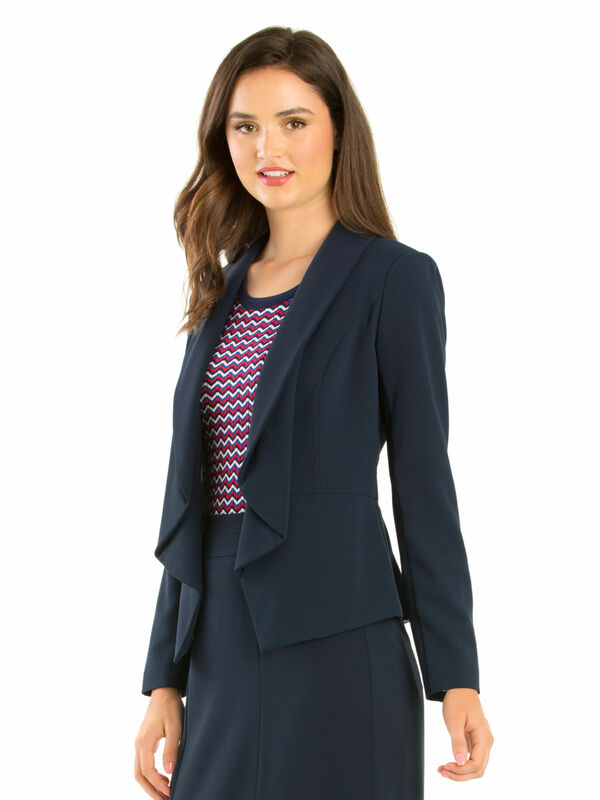 In a work appropriate heavy crepe fabrication, this waterfall blazer has a beautiful open drape. For a power suit look with all the power but more femininity, pair with the coordinating Aries Skirt. Take this blazer to the weekend by styling with a pretty blouse, jeans and boots. Aries Jacket is rated 4.9 out of 5 by 21. Rated 5 out of 5 by Rebecca_22 from The perfect fit! This jacket is absolutely incredible. I originally bought this jacket in red and later bought the pink as I loved it so much and it was such a great fit. It is loose and extremely comfortable whilst the seam around the waist gives the jacket a fitted and sleek design. The soft detailing at the front of the jacket makes the perfect statement. It is often difficult to find the perfect sleeve length but this jacket fits perfectly. The quality is also second to none! I would definitely recommend this jacket! Rated 5 out of 5 by Lukie from Elegant and versatile This is the most flattering and versatile jacket I've bought in many years. It's feminine with an elegant twist on a classic jacket which makes it diffierent from all the usual (boring) jackets. It's perfect for work and also looks great with jeans for a relaxed look. Great find! Rated 5 out of 5 by Elisa26 from Looks elegant I love this jacket because it looks great with my work clothes but can also be paired with jeans and a white t-shirt to make a casual outfit that little bit more dressy. It looks really cute if you roll up the cuffs and see the white and blue pokadot lining. Rated 5 out of 5 by Em34 from So comfy! I bought this jacket because it’s adorable but I wear it to work a couple of days a week and I love it because it’s SO comfy. The lining is so silky and the polka dots are real cute. Recommend to everyone for business attire or casual! Rated 5 out of 5 by LisaT from Best Jacket Ever! I just love everything about this jacket. It is a perfect fit, looks stylish, gorgeous lining and you can dress it up or down. I now have it in pink, red and black. Navy is next on my hit list!! Rated 4 out of 5 by Michelle92 from Beautiful style and great for work I bought this for work and love the design so much. Only negative is that it is a unique shade of navy and I can only pair it with a dress as it does not match any of my other navy bottoms! Rated 5 out of 5 by Mira from Perfect work jacket Perfect smart jacket with a bit of flare for work. It's really comfortable with the waterfall front but still looks really formal. Really cute lining too.